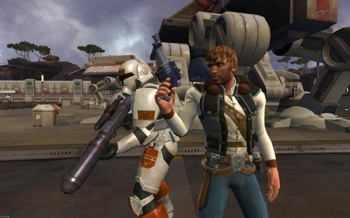 EA says Star Wars: The Old Republic is the fastest-growing subscription MMO ever, and that's good news for Origin. Star Wars: The Old Republic has sold more than two million copies since it launched six weeks ago and now boasts a subscriber base of 1.7 million users, which Electronic Arts says makes it the fastest growing subscription-based MMO ever. And while things are often ugly in the early days of a new MMO, The Old Republic has been a relative rock of stability, with servers "available for more than 99.5 percent of the time outside of scheduled maintenance." Some other noteworthy stats: Players have spent more than 239 million in-game hours in The Old Republic - that's more than 27,000 years of in-game time - more than 20 billion NPCs have been killed and more than 148 billion credits have been spent. In spite of that success and the release of Rise of the Rakghouls less than a month after the game went live, BioWare is curently at work on another big update, due in spring, that will add new content, game systems and guild features. "We're actively listening to our community for ongoing feedback to help us ensure the game and service continue to improve," said BioWare co-founder Greg Zeschuk. Thanks in large part to the popularity of The Old Republic, Origin, EA's digital distribution platform, is also doing quite well. Origin accounted for almost 40 percent of The Old Republic unit sales and has pulled in more than $100 million in total revenue since July 2011. More than 9.3 million users have registered for the service and while that's still just a fraction of the Steam user base, it's a pretty impressive number for a service that's been around for less than a year.